The Austin Healthmate is a heavy duty air cleaner. If you suffer from asthma or allergies then this is the perfect machine for you. It is capable of removing almost all the indoor air pollution from your house. It will get rid of allergens like smoke, pet dander, pollen. It removes germs, bacteria, mold spores, chemicals, odors, and other asthma triggers. It does all of this without producing any harmful by-products. The filters are long lasting (5 years) and come with a 5 year pro-rated warranty. The manufacturer's suggest retail price is $450. The Austin Air Healthmate Air Purifier has several attractive features. Cleans up to 1500 square feet. 15 pounds of activated charcoal and zeolite to remove chemicals and odors. 60 square feet of medical grade HEPA filter to remove everything else. According to the manufacturer, this model will clean a 1500 square foot room. Not many people have a 1500 square foot room. Just think about it many whole houses are only 2000 square feet. For most people this will clean any room in your house. The Austin Healthmate measures 23" high and it is 14.5" on each side. It is not very big, but it weighs a whopping 45 pounds. It comes with wheels to help you move it from place to place. If you need a more portable air purifier that has the same level of performance check out the Austin Air Healthmate Junior. This is where the Austin Air Healthmate stands apart from the competition. The Austin Healthmate uses a 4 stage filter. Stages 1 and 2 filter out the larger particles. This helps to extend the life of the charcoal and HEPA filters. Stage 4 is a true medical grade HEPA filter It filters out 99.97% of particles bigger than 0.3 microns and 95% of the particles bigger than 0.1 microns. The stage 1 and 2 pre-filters are designed to be cleaned by vacuuming. You can vacuum them through the metal grille without having to open the air purifier. Vacuum it once a month for best results. The stage 3 and stage 4 filters are one unit. Austin filters come with a 5 year pro-rated warranty. Most users can expect to get 3 - 5 years of use out of the filter. If your environment is dirty expect to change the filter more often. The filters have a pro-rated warranty. If you need an Austin Air Healthmate replacement filter before 5 years you will receive a discount on the purchase price of a new filter. In our opinion this filter has one major drawback. 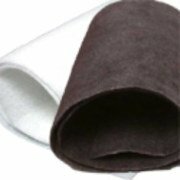 The charcoal and HEPA filters cannot be replaced separately. You might have to replace both filters when only one needs to be replaced. This is not going to be a concern for most people, but it is something to think about. 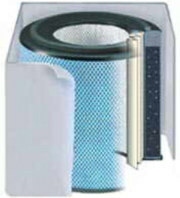 A replacement pre-filter (stage 1 and 2) is about $20 dollars if you purchase it separately. It is included in the cost of a replacement filter. At first glance this seems to be very high. Other purifiers have a HEPA filter that has to be changed once a year and pre-filters that have to be changed every 3 months. These filters can cost $100 dollars and the pre-filters can cost $15. Let's compare the cost of an Austin Healthmate to another air purifier. After 10 years, the cheaper air purifier cost $1640 to keep operating. The Austin Healthmate only cost $760. In the long run, the Healthmate is much more affordable. The carbon and HEPA filter are one unit. There is filter change indicator light. There is no remote control. It is noisy especially at the higher levels. It is very heavy weighing in at 45 pounds. It removes the chemicals and odors from the air. It helps them breathe easier. It helped with the smell after installing new carpet in the house. The metal grille is easy to dent. It is very heavy and hard to move around. 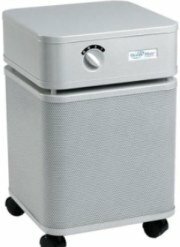 We feel that that the advantages of the Austin Air Healthmate Air Purifier outweigh the disadvantages by a lot. We think this is one of the best air filters out there today. If offer great performance while requiring very little maintenance. Although the Austin Air Healthmate replacement filters seem expensive, they do last for up to 5 years. This really makes them more economical than many other brands. We would recommend this for everyone who wants or needs cleaner air. Leave Austin Healthmate Page and Return to All About Air Purifiers Home Page.